Check Shopko Weekly Ad & Flyer Deals. 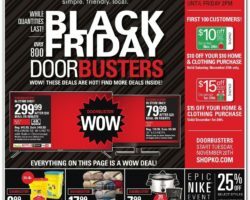 Find this week Shopko Ad, electronics sales, printable coupons, weekly circular prices, clearance deals, and current savings. Shopko is not your typical department and grocery store. They are the designated shopping destination for birthday gifts, last minute holiday gifts, home essentials and everyday needs. They stock hand towels, kids’ clothing, holiday decoration, foods, workout clothes, toys and a lot more at great prices and with very good sales running across departments. As an online retailer, Shopko has free shipping promotions for qualifying purchases all the time and usually ships anything in the clothing department at no charge with $49+ orders. They carry holiday sale of up to 40% off select women’s, online-only promotions of extra 15% off jewelry and watches with promo code, and feature weekly specials of up to 65% off on gold and silver jewelry, up to 50% off bedding, 20% off Lego and so much more. Shopko pharmacy offers many types of immunizations and provides coupon discounts of $5 for $25 in-store purchases.